Ready to use, this convenient hose-on weed killer is suitable to use on Buffalo and other common lawn types. It selectively controls bindii, clover and other broadleaf weeds. 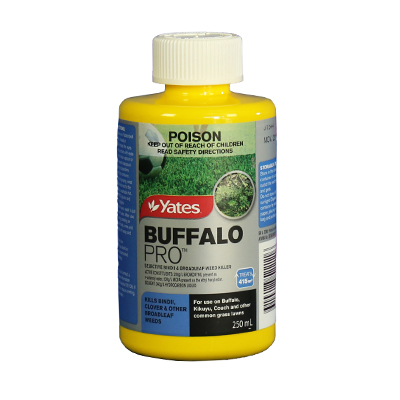 Yates Buffalo PRO Hose-on Weed Killer is a selective hose on herbicide for controlling weeds. Ready to use, this convenient hose-on weed killer is appropriate to use on Buffalo and other common lawn types. It controls bindii, clover and other broadleaf weeds selectively. With no mixing necessary this product is ready to use and 2L will cover an area of 100m2. 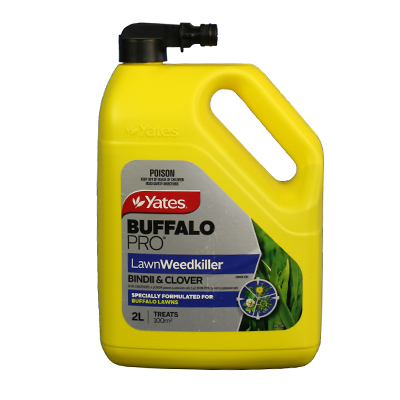 Yates Buffalo Pro Hose-on Weedkiller targets: Bindii, capeweed, catsear, clovers, creeping buttercup, creeping oxalis, cudweed, dandelion, lamb’s tongue (plantain), thistles, fleabane. Measure the lawn area before application and use caution when applying near garden beds and shrubs. Apply when the weeds are growing actively. 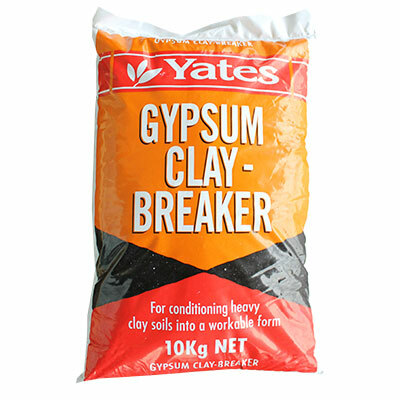 You may not notice the effects of Yates Buffalo Pro Hose-On Weed Killer for up to 3 weeks, the weeds will die slowly. Repeat applications may be necessary to control advanced weeds or certain types of clover. All you need to do is connect your garden hose to the hose-on applicator, turn on the tap using moderate to high water pressure. 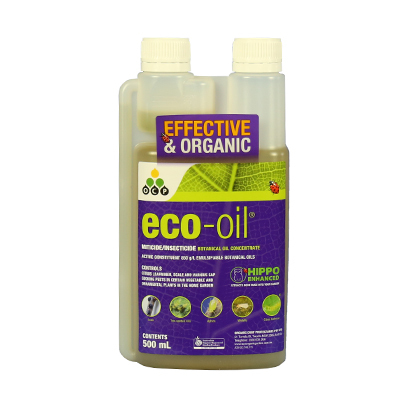 The water mixes automatically with the concentrate in the proper ratio. Walk and spray the lawn at a steady pace whilst sweeping the spray in a back and forth arc. Overlap treated areas slightly. DO NOT use on Lippia, Dichondra, Durban grass, or Strawberry clover lawns and new lawns less than 3 months old. Before application onto new varieties of Buffalo grass, test on a small area first. DO NOT allow spray to contact or drift onto plants you do not want killed. DO NOT allow children and pets to enter treated areas until spray has dried. DO NOT feed treated grass clippings to poultry, livestock, or use to mulch plants. DO NOT use this container for any other purpose. SAFETY: Keep out of reach of children. Read safety directions. This product will irritate the eyes and skin, so avoid contact with eyes and skin. When mixing the product for use, wear PVC gloves of elbow length, and us a face shield or googles. When using a sprayer or controlled droplet applicator, wear water proof protective clothing, and good solid impervious shoes or boots. After using this product, and before eating, drinking or smoking, make sure you wash your hands, arms and farce thoroughly with soap and water. After use for the day, wash the gloves, googles, face shield and any contaminated clothing. FIRST AID: Contact a doctor, or poisons information centre (131 126) should any poisoning occur. LIABILITY: This product can only be used as directed, and the product supplier has indicated it will not be liable for any loss or damage arising from a failure to strictly follow the directions for use. Store in a cool well-ventilated area in the original container. Don’t keep it in direct sunlight for extended periods. Triple rinse or alternatively pressure rinse containers before they are discarded. It’s a good idea to add the rinsings to the spray tank. Do not dispose of undiluted chemicals on site. If you want to recycle the container, replace the cap, clean as outlined above, and take the clean container to a recycler or designated collection point. If discarding, crush, break or puncture and bury the empty container in a local authority land fill. If it cannot be sent to an appropriate land fill site, bury the containers below 500mm in a disposal pit specially marked and set up for this purpose, away from waterways, desirable vegetation and tree roots. Do not burn empty containers.